Despite ‘Cascades’ having been recorded in upstate New York, their hearts and minds were far away, thinking of home and the synthpop music they grew up with. In addition to their fondness for wide expanses of surf-y real estate down under, they’ve cited John Farnham’s mid-‘80s anthem ‘You’re the Voice’ and the back catalogue of Icehouse (a band also favoured by fellow Aussies Little May, who covered the band’s ‘Great Southern Land’ on their recent tour of America) as important inspirations for the new LP. Make no mistake, though: this album sounds fresh and bracing, not at all like a badge-covered denim jacket of that bygone era that’s simply been dusted off. This desire to channel and, ultimately, also recreate this feeling of an arms wide open-type of freedom is palpable throughout the album. Opening track ‘Boxing’, which premiered in early December on influential Seattle radio station KEXP, moves forward in a pleasantly languid pace. The tune also tapped into the duo’s feelings of euphoria following their own early morning boxing classes, Chang describing the chord-driven instrumentation as “sound[ing] like a giant walking through a vast landscape”, while his recording partner Jack Milas’ breathy lead vocals add dreaminess. It’s a positive kind of dreaminess, too: one that will lift you out of the shadowy fog of this winter and onto a brighter plane. Album standout ‘How Could You Know’ is a great mix of pop and indie, with prominent guitars and a catchy Fleetwood Mac-esque beat playing off Milas’ voice extremely well, as if it was just another instrument in their arsenal. Another great, catchy moment is the LP’s title track, proving that even with a lot going instrumentally, in the right hands and with the right amount of restraint, a beautiful, timeless quality can be applied to a synth-driven pop song. Not too much, not too little. Just right. When speaking of ‘Cascades’ as a whole, Chang says, “We just tried to make the record beautiful…We weren’t trying to be edgy or difficult – we were striving to make it as epically beautiful as we possibly could. Hopefully when people hear it, it will make them think of something that’s important to them.” Mission accomplished, guys. 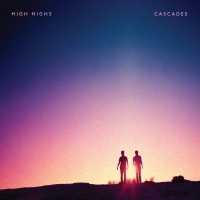 The second album from High Highs, ‘Cascades’, will be out on this Friday, the 5th of February, on PIAS. For more on High Highs on TGTF, you can read my Bands to Watch introducing the duo originally from Australia that posted back last November here.